Click-&-Go™ Cell Reaction Buffer Kit provides researchers everything required to perform the click reaction on cells tagged with an azide or alkyne and with the corresponding click detection reagent for subsequent downstream analysis by flow cytometry, fluorescence microscopy, or high content screening (HCS). Staining with additional detection reagents can performed prior or after the click reaction. Each kit includes sufficient material to perform 50 reactions based on 0.5 mL volume. 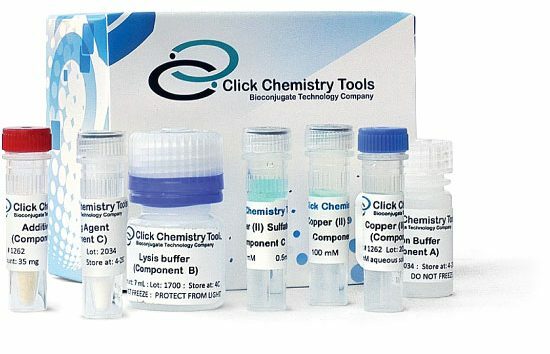 Click-&-Go™ Cell Reaction Buffer Kit provides researchers everything required to perform the click reaction on cells tagged with an azide or alkyne and with the corresponding click detection reagent for subsequent downstream analysis by flow cytometry, fluorescence microscopy, or high content screening (HCS). Staining with additional detection reagents can performed prior or after the click reaction. Each kit includes sufficient material to perform 50 reactions based on 0.5 mL volume. The performance and components of this kit are identical to Click-iT® Cell Reaction Buffer Kit from Thermo Fisher Scientific. Click-iT® is a registered trademarks of Thermo Fisher Scientific. Click Chemistry Tools is not affiliated with or endorsed by Thermo Fisher Scientific. Click-&-Go™ Cell Reaction Buffer Kit IS NOT manufactures, distributed, or affiliated in any way with Thermo Fisher Scientific.